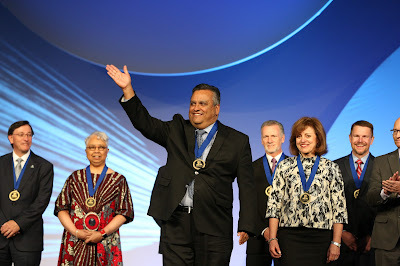 Dr. Bustamante was recently honored as one of 19 college presidents in the nation to receive the prestigious Phi Theta Kappa Shirley B. Gordon Award of Distinction at Phi Theta Kappa’s 99th Annual Convention held in Nashville, TN. This award was named in honor of Phi Theta Kappa’s longest serving Board of Directors Chair. College presidents and campus chief executive officers, nominated by their Phi Theta Kappa chapters, were carefully selected for this award based on their outstanding support of the Phi Theta Kappa organization. To learn more about the Alpha Theta Omicron Chapter of Phi Theta Kappa at Rio Salado, please visit riosalado.edu/ptk. Labels: Excellence in Education, LifeAtRio, LiveAtRio, PTK, PTKNews, Rio Salado, Rio Salado College, RioCommunity, RioLearn, RioLounge, RioNews, RioPresident, RioStudents, RioStudents.